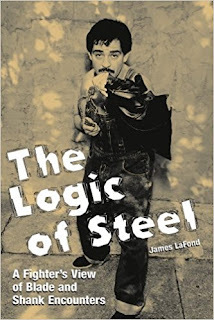 The Logic of Steel is not about the art of knife fighting. Its sole purpose is to illustrate the cold, hard, logical nature and dynamics of real-world edged-weapon encounters as experienced by author James LaFond and more than 90 other people who have found themselves suddenly caught up in a knife fight. For the past five years James LaFond has been assembling and analyzing data about violence in his Baltimore, Maryland, neighborhood and elsewhere. Here he offers a comprehensive analysis of more than 250 acts of violence that involved the use of an edged weapon, as told from the perspective of the attackers, eyewitnesses, and victims. The action is broken down by weapon type (razors, folders, butchers, balisongs, switchblades, sickles, swords, and improvised slasher/stabbers) and use patterns. The circumstances, motivation, and mechanics of real blade and shank fights are illuminated through the use of gripping (and often comical) first-person accounts, photographs, and hard statistics. Also discussed are the psychology, injury patterns, and legal ramifications of knife fighting, as well as invaluable tips on how to prevent clinches and floor fights from escalating into knife fights, how to survive unarmed against an armed assailant, how to dress for success against a knife fighter, and how to live to fight another day by successfully running away from an armed attacker. If you want to be able to spot a knifer—and predict his behavior—before it's too late, The Logic of Steel is a must read. James LaFond lives, works, and writes in Baltimore, Maryland. He has somehow survived 21 boxing matches and 618 stick fights. If you would like to beat James with a stick, you may find contact information for him at www.jameslafond.com . For related articles, go to this website and click on Harm City.